Allow me to introduce, Tina Holmes, a woman with a truly geeky musical passion — and I mean that as a huge compliment. Tina collects guitar picks. Thousands of them, in all different shapes and colours, from different eras, commercial and hand-made. Basically, if it is a pick, she wants to see it. The best way to see her collection — which is in Bristol, England — is via her website, which I link to here. But I have taken the liberty of lifting a couple of her pictures from the site to give you some idea of what we are talking about. 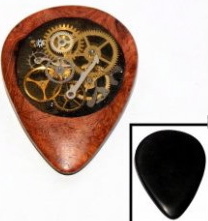 I was particularly taken by “The Steampick”, a hand-made piece of art made of Thule wood with an ebony back.and an inlaid design made from watch parts. She also has ones in the shape of Texas, Mickey Mouse, an extracted tooth and Jason’s mask from Friday the 13th. A lot of them have special names such as Buckcherry Razorblade and Snake Pick, which wraps around your finger. Who knew!? I have only “met” Tina via Twitter – she is on @tinaspicks and I am on @musicJJMG – but I did do an email interview with her. Remarkably, she says she only started her now 2,000-strong collection 18 months ago. First question, why? I am interested in seeing how the pick has evolved, how different companies/people have come up with new ideas to invent the ‘perfect pick’. There have been and still are, some really wacky inventions out there, picks with holes, grooves, grips, attachments, multiple sides, etc. I only buy picks I like. I pay what it is worth to me, not what I think it is worth to someone else. I don’t invest in picks to make money. I am only interested in having one of each individual pick in my collection, so don’t try and over buy. Some people buy up known stock to try to ‘bump’ up the value, (both perceived and actual) but I think it is nicer to just keep one and let others have a chance of owning one too so I have given lots of my duplicates away. Since collecting picks, it now amazes me how people are willing to spend thousands on the perfect guitar, amp or pedals, then go and spend 50p on any old boring pick and then often stick with the same one. I don’t think this is helped by shops that tend to stock a limited range. I thought one of Tina’s most interesting comments was that she has not had much luck in getting picks from musicians themselves. Initially, she wrote to some asking for them to send picks to her, but no one replied, probably because there is a famous-person’s-pick reselling thing going on on the likes of eBay. But Tina doesn’t trust a lot of these. There is no provenance. All this got me looking at my own collection – three, common or garden Jim Dunlops, one .677mm and two .73mm nylon. Pathetic. Give Tina’s website a look. I can assure you it is well worth it.